The Crosstour's V-6 engine features the latest generation of Variable Cylinder Management™ (VCM®) technology. This system can activate and deactivate the engine's cylinders as needed to meet the demands of both acceleration and fuel efficiency. When maximum torque is required, all six cylinders are firing. During steady cruising speeds, VCM® allows Crosstour to run on just three cylinders. The available Real Time 4WD™ system engages when slippage is detected and you need to send power to where there is tire grip. This is a hydraulically actuated system that operates only when front-wheel slippage occurs, helping you through terrain that can be tricky to maneuver. 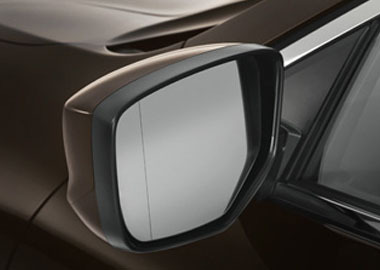 The 2015 Crosstour CUV features an Expanded View Driver's Mirror on the driver's side that helps reduce the blind spot by expanding the field of vision. 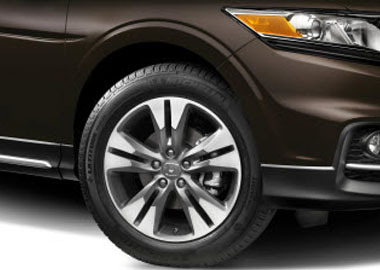 Turn heads with every rotation of the attention-grabbing 18-inch alloy wheels (V-6 models). The Crosstour's unique exterior styling is what draws people in, but it's the refined and luxurious interior that keeps them there. The Crosstour is a veritable electronic wonderland, loaded with available cutting-edge technology, including Bluetooth® HandsFreeLink® , the Honda Satellite-Linked Navigation System™ with voice recognition and SMS text message function. The Crosstour boasts plenty of flexibility and cargo space, thanks to the 60/40 split rear seatback. A hidden removable utility box and reversible floor panels to protect the rear carpeting add to the interior allure and make it one versatile family crossover. Steering wheel-mounted controls let you access many of the Crosstour's onboard systems while you keep your eyes on the road. The Crosstour offers an available Honda Satellite-Linked Navigation System™ with voice recognition that puts a vast database of maps and points of interest at your beck and call (EX-L models only). The intelligent Multi-Information Display (i-MID) on EX-L and V-6 models puts a host of useful information right in front of you. A quick glance at the 8-inch screen on your instrument panel can tell you what kind of mileage you're getting, what kind of music you're listening to and even show you your text messages. All Crosstour models feature a rearview camera to make moving in reverse easier. Guidelines allow for extra precision when backing into tight spaces. EX-L and V-6 models offer the added benefit of a multi-angle rearview camera with guidelines. The Advanced Compatibility Engineering™ (ACE™) body structure is a Honda-exclusive body design that utilizes a network of connected structural elements to distribute frontal crash energy more evenly throughout the front of the vehicle. This helps reduce the force transferred to the cabin and evenly disperse the forces transferred to other vehicles involved. All Crosstour models feature 4-wheel disc brakes with anti-lock brakes (ABS). ABS pulses the brakes to help prevent wheel lockup and help the driver retain steering control during hard braking. The system also features Brake Assist, which helps the vehicle come to a stop sooner during emergency braking, and Electronic Brake Distribution (EBD), which distributes brake force among the four wheels based on how much load each wheel is bearing. In a sufficient rear-end impact, the active head restraints move forward and up, helping reduce the likelihood of neck injury. A small camera mounted at the top of the front windshield can detect the presence of vehicles in front of you. When the FCW system (EX-L models) calculates that you are at risk of a collision, it immediately activates audio signals and instrument-panel alerts. 22 city/31 highway/25 combined mpg rating for 2WD 4-cylinder models. 20 city/30 highway/23 combined mpg rating for 2WD V-6 models. 19 city/28 highway/22 combined mpg rating for 4WD V-6 models. Based on 2015 EPA mileage ratings. Use for comparison purposes only. Your mileage will vary depending on how you drive and maintain your vehicle.